Well guys ... Harris asked me to write this and to be honest, details are a bit shaky. I usually can tell you every detail of every goal, it plays back like a video in my head, but to be honest, I can't. For the most part, what I do remember is not the good stuff. I know the Chiefs scored their early goals on a couple of turnovers and I also remember the game turning around for us once we stopped playing stupid. I believe that for one, Glenn Farkas got his head together and stopped leaving the defensive zone early and started really hustling and that caused a few good chances off turnovers. I also remember Harris coming up big on back to back breakaways and Tony getting pretty agitated at the non-calls and taking over the game. He and Jason seem to know each other pretty well and when they decide to apply themselves it is a pretty awesome display. Obviously, Danny's gritty style fits nicely with their playmaking ability so we will try to keep them together as much as possible. Now you all know why I try to protect my head, my memory is officially shot, seems I have trouble remembering anything except to have 4 good square meals a day. Attendance (players): DiPierro, LeMatty, McLaughlin, Gucci, Farkas, Nicolosi, Serkin, Toscano, Hand, Farrell. Net: Harris. Scoring: 1st period: 2-2 tie: Goals by DiPierro (Serkin); Toscano (DiPierro, Nicolosi). 3rd period: 3-3 tie: Goal by Toscano (DiPierro). OT: 1-0 Chiefs. On the same night the Pirates lost 4-3, the Phillies beat the Rays 4-3 to clinch the World Series. Coincidence? 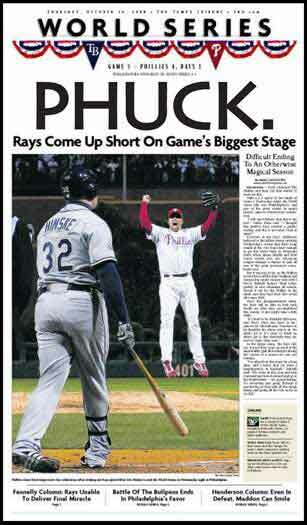 Kudos to the The Tampa Tribune for some ambitious headline writing on their sports cover. For his pair of goals.